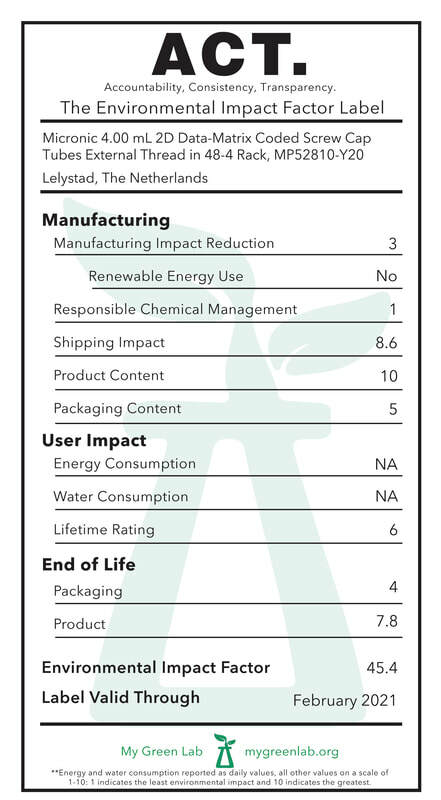 This category evaluates the steps that have been taken to reduce energy, water, and waste at their manufacturing facility. The score of 3 in this category reflects Micronic's efforts to reduce energy (gas and electricity) and water. The manufacturing facility in which the product is made does not use renewable energy. The score of 1 in this category reflects proof of a verified ISO 140001 system in place. The product does not contain Red List or GreenScreen List-Translator 1 chemicals. The product is made in Lelystad, The Netherlands. The product is made with virgin materials; no sustainable content is used to manufacture the product. The inner box contains 100% FSC-Certified material. The product does not consume energy. The product does not consume water. The product is typically used only once, however it is capable of being stored for long periods of time at low temperatures. The outer and inner boxes are readily recyclable in the United States. Additional information about how to dispose of the product's packaging can be found here. The product can be recycled but it is not readily recyclable. The caps and tubes are made of polypropylene (#5) and the racks and lids are made of #7 plastic. Additional information about how to properly dispose of the product can be found here.